I received an early release copy of this book from the publisher in exchange for an honest review. Unfortunately, for the book, that is what I am going to be – honest. I gave this book two out of five stars on Goodreads. This is unusual for me and frankly, hurts my heart a little bit. I usually at least ‘like’ a book, finding some reedeming qualities within its pages. This book however was very disappointing and I cannot think of one compliment to give it. The description sounded interesting and powerful; it is the story of a young lady who it appears is sexually assaulted. It wasn’t only the stream of consciousness writing style that I found let the story down, I understand there are times when that writing style can be very impactful, but you should still be able to piece together what is actually going on. 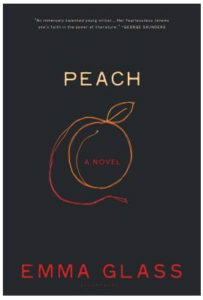 This book was so strange that you couldn’t tell what was real and what was imagined by the main character, Peach. The other characters in the story were all so strange it was laughable. The ending was so bizarre with the most insane BBQ happening, I am still shaking my head about it. Luckily, it was very short so I made it through the whole thing. Overall, I found it confusing, disturbing and utterly pointless. I cannot imagine to whom they are going to market this book. I wish them luck.